Is the truth really out there, or much closer? Just would like to follow up with you please and if you could answer a few questions about the YouTube debacle. 1. What do you think happened with the MUFON involvement? Were they responsible for your suspension? 2. When do you think that your original account will be reinstated? 3. What would you like to say to your detractors? 4. Are you planning any legal action of any kind at all? 5. Why do you think you were targeted out of all the various YouTubers who post UFO imagery to YouTube? If you can take a few minutes to respond I’ll post directly to my blog, unedited. You’ve got a lot of fans out there wanting to know more. Thanks Alison. 1. The Youtube account suspension was directly due to 9 or 10 false copyright infringement claims filed by Youtube accounts using FAKE names not associated with the real people involved. MUFON and MUFONpa/Bill Burns were not involved. I was told by others, these are a gang of “trolls” who do nothing but attack usually UFO & paranormal channels with fake anonymous accounts, whose sole purpose is to eliminate them from Youtube. These same jerks visit various blogs and UFO-type chat rooms and even spread the slander/debunking comments there also in attempts to try & sway the public into not believing it. A common tactic, I am told, of disinformation agents…. or it might be just close-minded idiots who can’t process any new information disseminated to them. These same actors have also issued demands that anyone caught uploading my videos to their own channel can expect the same channel-suspending treatment, insults, and have slandered them as well. It is unfortunate, however, that PA MUFON is so busy with the ton of UFO reports that he (Director) had only time to spend about 1 hour outside here (and he showed up LATE after all the good stuff). He forgot that he saw round lights that did not blink while viewing my Generation 3 Nightvision scope–which he stated he couldn’t understand why they weren’t blinking. He then only spent another 1/2 hour seeing my IR home cam on my little monitor, before writing off I what I had been reporting. I DID post a red-blinking UFO that I filmed SHORTLY AFTER HE LEFT. Another person who filed a UFO report nearby in Trafford, PA also has reported the same activity, yet she only got an answering machine message referring to mine being debunked. He apparently has no prior knowledge of the famous Pine Bush, NY study by Dr. Bruce Cornet, or it might have occurred to him that this might be a similar phenomenon–which I believe it is. To investigation this properly, it would take at least 3 investigators with low-lux camcorders & high-powered binocs, surrounding the area on at least 3, preferably 4 sides, to prove the origination of the objects coming from “the woods” and NOT just planes approaching and flying over my area. A simple SECONDARY Radar report request showing identifying radar data could have accomplished the same. Yet NO RADAR REPORTS have ever been produced proving conventional aircraft–NOT ONE. Such a simple request, I think… A lot easier than this massive slander campaign. Even I have managed to get a response from FAA, and mine said there was no record of any any craft in the area for the date/time/location requested as shown on Pittsburgh Surveillance Radar. My footage is embedded with date/time AND GPS of location shot, and sometimes even has corresponding surveillance IR footage to match. 2. Since I filed counterclaims (which gives the debunkers my address information) against the false copyright ones (all of them), the fake people only have 10 days (after Youtube acknowledges it, which just happened today) to serve me a Court complaint to stop–which I’d love to see. Then the claim expires. We shall see what happens then. In the meantime, I’ve given fans permission to upload their favorite videos of mine anywhere they wish. Only the insulting debunkers will have copyright claims filed by ME against them. They have, however, already made a FAKE channel name recently with my Facebook page, a copy of my channel, and used the name: Alison Cruse to file fake copyright claims against a Youtuber who came here to see them in person and is now sticking up for me. 3. In a weird way, I should say “thank you” for making this, the morphing orb/fake plane UFO, such a controversial subject. While back when Dr. Bruce Cornet was talking about it, while researching the Pine Bush, NY reoccurring UFO phenomenon, it apparently didn’t get enough attention–because that type, the UFO-pretending-to-be-a-plane, (complete with FAA-style flashing lights & sometimes fake sound) wasn’t even added to “the list” of generally accepted or known UFO types. Linda Moulton Howe even published research on “Pretender UFOs”, which I had found when it occurred to me that these UFOs might be trying to LOOK like our aircraft to go unnoticed. So now that they, the debunkers, are mentioning my name in their parody videos–it only makes people want to find out what all the fuss it about. Why last week I was #92 Most Subscribed Channels in all of Youtube because of their crap. They now think they can intimidate me with threats of legal action for shining lights at UFOs. I think that would be most helpful to the UFO community in general if I could get media attention for my footage–when it’s proven that what I pointed a light at an unidentified flying object that DOSN’T SHOW ON RADAR, don’t you? One only has to do search on Youtube for some of the following to find more videos of the same UFO types as I have filmed: morphing, hologram, fake plane, fake jet, orange orb, transformer UFO. There are probably at least 50 more in several different countries–from Brazil to Moscow to Norway to Canada & all places in between. 4. I have not written off legal action at this point. The threats, defamation of character other harassment is escalating. Now I know what fame must feel like. I can take it though, it’s in my heritage to stand against opposition when the cause is just. 5. Perhaps because I’m a woman who’s standing my ground. And so are the people that have been here and seen the plasma orb action in person. And so are the countless others who’ve been filming them and are withstanding similar attacks. I am spending my own money & time to show what is going on only to educate everyone, not to open a debate. they have the choice to not believe it and move on if it doesn’t fit their bill. Those not seeing this stuff and are on the other side of a flat screen with no depth-of-field are simply not qualified to tell others what they’ve seen. Those without proof to the contrary (like radar) are not qualified either–especially when it concerns mimicry. I would hate to have these guys in our military when the other side starts using the type off hologram technology our guys are working on now. They’ll be, “Hey, we can’t shoot at that! I don’t care if they’re not suppose to be here, they’re not on radar or respond to radio contact, are violating the no-fly-zone… and flying low over houses, it looks just like a civilian plane with it’s flashing lights!” See my point? There are also THOUSANDS of orange UFO videos online too. I believe all orange UFOs probably have the ability to transform or morph into objects that pretend to be ours to blend in, go unnoticed and not be shot at. I think they might have meant these times…. If you’ve been following my blog on the strange occurrences in the skies over Murrysville Pennsylvania, then you’ll know that I am an avid fan of one Alison Kruse and her unusual postings. In fact, Alison’s YouTube videos (SeeingUFOsPA) have caught the attention of more than the few of us who believe that the Earth is being visited by Extraterrestrial Biological Entities. Emmy Award winning journalist, Linda Moulton Howe featured Alison and her videography in her November 25th Earthfiles.com segment, found here. Linda doesn’t like to have the wool pulled over her eyes, and I do feel that she saw legitimacy in Alison’s postings. 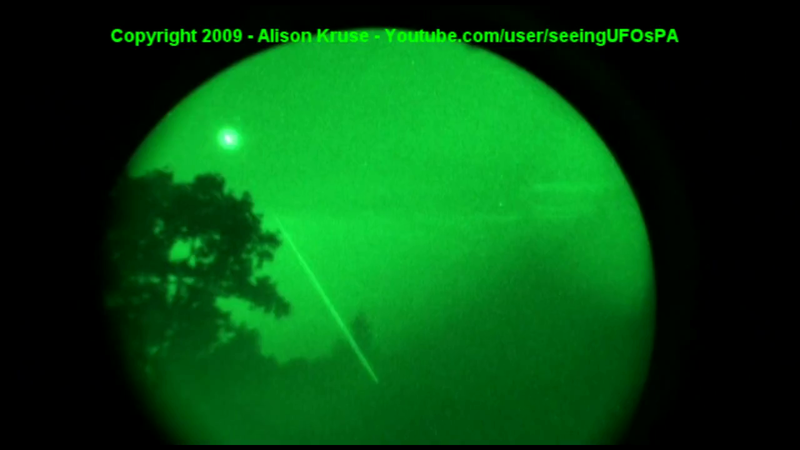 The video that caught everyones attention was the one in which there appears to be a craft using a laser to scan the ground about 150 feet in front of Alison. There have been many people who go out “on the hunt” with Alison as she faithfuly patrols the forests and golf courses around this suburb of eastern Pittsburgh. So she does have witnesses to back up her claims of what she records on her HD Sony. But there’s something up. Alison has been the victim of harrasment on YouTube where her account has been threatened with suspension for illegaly using copywritten material! Kind of hard to be illegally using your own videos don’t you think? But this has been the case, where others are claiming that they are the owners of her recordings and have had YouTube disallow access to her own imagery. This is incredible. Either the debunkers, the ones who claim that she is simply filming aircraft (tell that to the cops and the airline pilot who were out on the hunt with her and couldn’t explain what they saw) have way too much time on their hands, or that she is an actual target of something more sinnister. A government conspiracy to shut her up and shut her down! The threats against Alison are found in the video below, which she recorded off her computer screen. Either way, this is one sad situation in the land of the FREE? UPDATE: Alison’s YouTube channel has been suspended! I guess “they” got what they wanted after all! Who Is Alison Kruse And What Is She Seeing? Here’s one of Alison Kruse’s latest videos from Murrysville, PA. Alison was recently interviewed by Emmy Award winning reporter Linda Moulton-Howe on Linda’s Earthfiles.com site. Here’s a link to Earthfiles and the interview with Alison about some of the very strange craft that she sees in PA and the video below which shows a craft scanning the ground with a pinpoint laser. I had one comment from a reader by the name of “Brad”. Here are his views on Alison’s “laser firing UFO” video and a brief retort from me. “Do you people ever investigate the videos you put in here? This woman is looking at a commercial aircraft, the camera is out of focus to cause the plasma orb & everybody knows that ufo’s don’t shoot lasers! There is a military base at Laurel Caverns orienteering courses. Those Apaches love to﻿ buzz the tree-tops and hillsides. Also, they have laser targeting systems for munitions, and they appear similar to what you saw when viewed through NVG’s. She is surrounded by several air/helioports in her immediate vicinity. Her very last video you can even see the nose of a plane and her out of focus lens making it appear as though it is an orb and to the right you can see the plane ascending whilst skewing her perception of the lights thinking the plane is morphing! You all need to start checking out this stuff before putting it on your sites. There is no noise associated with these craft in particular. The local Durham cop chopper where I live you can hear from about a mile away, beating the air with its rotor. Unless the U.S. has invented a new type of chopper, that is silent of course?! Everyone knows that UFO’s don’t shoot lasers! Say’s who? Apache helo’s do make noise, a lot of noise. What the hell would they be doing hovering over a golf course and tree tops in a relatively suburban area of Pittsburgh for? There is a bent towards the Air Force in your writing Brad. Is that who you work for? A brief compilation of historical sightings of UFO’s (or strange arial phenomena) between the years 45,000 and 9 BC. 45000 BC China: Rock carvings of round UFO-like objects have been found in China’s Hunan province. The depictions date back to age of the Neanderthals. 12000 BC China: The Dropa, the name given to visitors from Sirius, came down from the clouds with their air gliders. 8000 BC Australia: The Aborigine believed in “dawn beings” from the stars. Australian aboriginal cave drawings depict celestial beings, with antenna and x-ray style drawings. They were very advanced in “aerodynamics”. The boomerang is identical to a modern day aircraft wing. Aborigine means “from the beginning”. 4000 BC The Sumerians from today’s Iraq had contact with extraterrestrial civilizations according to their text. The extraterrestrials also interbred with humans and traveled with them to the stars. The kings were taken to the stars by the extraterrestrials. Sumerian text coincides with “the book of genesis”. Their astronomy was highly developed. They had numbers with 15 digits! The Sumerians say extraterrestrials are from Mars, the star system Pleiades, and the star Sirius. Sumerian text shows drawings of solar system. 3000 BC China: From the book ” Memories of the Sovereigns and the Kings ” published in the 3rd century AD, in China, in the third millennium B.C., before the birth of Huang Ti or of Chi You , “sons from the sky”, would descend to Earth on a star which was the shape of a saucer. 2345 BC China: The, Hsui-nan-tzu, a Chinese classic there is a description of ten suns appearing in the sky. 2000 BC Peru: Pre-Incan civilization records the gods were from the star system Pleiades. Inca ruins have been found at 13,000 feet, with one stone weighing 20,000 tons. Legend tells of spaceships that came from the stars. Inca ornaments of “platinum” were found. Text reveals the Inca’s knew the earth was round. 1766 BC China: The Emperor Cheng Tang commissions Ki-Kung-shi to construct a flying chariot. After construction the aircraft was tested, reaching the province of Honan. The vessel was destroyed by imperial edict, as he Emperor feared the mechanism might fall into the wrong hands. 1500 BC Egypt: The Palace of Pharaoh Thutmosis III. Circles of fire are said to have hovered over the palace while fishes, winged creatures, and other objects rained down from the sky. 593 BC Ezekiel witnesses an event which some writers have claimed sounds suspiciously like a UFO encounter. Josef Blumrich, former chief of the systems layout branch of NASA, set out to disprove such suggestions, however, from a careful analysis of the data available, he concluded that the vehicle described in the Bible actually was a UFO. 400 BC India: From the Mahabbarata. Blazing discs burned and destroyed an entire city and its inhabitants, before returning to the hand of Vishnu. 332 BC Phoenicia, Tyre: During the siege of the trade capital of Phoenicia by the Greeks a fleet of flying shields is described as plunged from the sky and crashed upon the city walls. 329 BC Alexander the Great records two great silver shields, spitting fire around the rims in the sky that dived repeatedly at his army as they were attempting a river crossing. The action so panicked his elephants, horses, and men they had to abandon the river crossing until the following day. 218 BC Rome: Glowing lamps were seen in the sky at Praeneste, a shield was observed at Arpi and in the Amiterno district, the sky was all on fire, and men in white garments appear. 99 BC Rome: In Tarquinia, there fell things like a flaming torch in different places from the sky. Towards sunset, a round object like a globe, or round or circular shield took its path in the sky, from west to east. 90 BC Rome: In the territory of Spoletium, in Umbria, a globe of fire, of golden color appeared burning in the north with a terrific noise in the sky, then fell, gyrating, to the earth. It then seemed to increase in size, rose from the earth, and ascended into the sky, where it obscured the disc of the sun, with its brilliance. It revolved towards the eastern quadrant of the sky. 73 BC Asia Minor, Pontus: While Roman legions were engaged in battle near the Black Sea against King Mithridates a huge flaming object fell between the two armies. It was said to have a shape like a wine jar and was the color of molten lead. 12 BC Rome: A comet-like object hovered days over Rome for several then melted into flashes resembling torches. 9 BC Japan, Kyushu: Nine moons were seen in the night sky over the community. I’ve been following Alison’s posts on YouTube for a few months now. She recently purchased a Gen 3 night vision scope with a 5x lens and attachment for her HD video camera. On the very first night out with her new scope, Alison picks up an object which releases a thin beam of light towards the ground. Alison points out in the video, that there is an abandoned coal mine right in the vicinity of this laser “scan”. This is certainly worth a look and if you are interested in following Alison’s channel in YouTube, it’s right here. What’s That Book In Hillary’s Hands?